- Publisher This book proves to atheists that they don't exist, reveals to agnostics their true motives, and strengthens the faith of the believers. This book answers questions such as "Who made God?" and "Where did Cain get his wife?" The book uses humor, reason, and logic to send a powerful message. Here are some reactions from atheists who read the book . 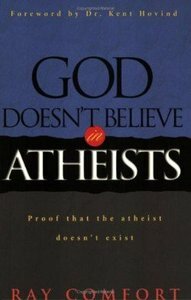 . .
About "God Doesn't Believe in Atheists"
This book proves to atheists that they don't exist, reveals to agnostics their true motives, and strengthens the faith of the believers. This book answers questions such as "Who made God?" and "Where did Cain get his wife?" The book uses humor, reason, and logic to send a powerful message. Here are some reactions from atheists who read the book . . .
Ray Comfort of Living Waters Publications (LWP) and Way of the Master is an internationally-renowned Christian evangelist, speaker and author. He has written over 40 books and LWP produces and distributes close to 6 million tracts each year (that practically give themselves away) and also offers the Excellence in Evangelism video series. His ministry has been commended by Franklin Graham, Josh McDowell, Dr. D. James Kennedy, Bill Gothard, David Wilkerson, Joni Eareckson Tada, and many other Christian leaders. Most recently he has authored Moody Gold and Conquer Your Fear, Share Your Faith and Comfort Food. Customer Reviews For "God Doesn't Believe in Atheists"
Witty, sarcastic and brilliant, Ray Comfort's 'God Doesn't Believe in Atheists' is extremely well written. The humorous and controversial title of this book caught my eye and I could not put it down. It provides a great argument for the Christian faith and highlights the proof of a creator throughout creation. Whether you have questions yourself or need a better way of explaining your faith to others, this book has great answers and explanations for a lot of those difficult questions. A very entertaining and enlightening read!